Blair Thomas commutes to work in rain, snow, and wind in Ogden. The Postal Service delivers in all types of weather. Blair Thomas rides to work in all types of weather be it rain, snow, headwind, heat or cold. Therefore 21-year-old Blair Thomas earns the moniker “Mailman” for his ability to get to work despite the environment. He lives in Weber County and commutes to his current job as a Deli Associate for Wal-Mart. Cycling Utah: Blair, tell me about your bike commuting experience. Blair Thomas: I've been a bike commuter since 2009. I always ride my bike everywhere I go, as it’s more fun than a car any day. I have had several bikes since 2009. I average about 1800+ miles/year. You can call me a mailman. I ride in rain, snow, wind, etc. ; the weather will never stop me from riding and getting where I need to be. It’s just another challenge that needs to be met and conquered so that others can see that it’s not too hard if you keep trying and have a good attitude. C.U. : You are one of the youngest bike commuters that I have profiled. How did you get started riding your bike? B.T. : My family is basically your run of the mill Utahns. I have a brother and 3 sisters, along with my mom. We are basically a normal American family. The people that got me started in cycling would have to be friends and family. My sister Sasha who used to ride her bike when she didn’t have a car influenced me. At this time I'm the only one in my family who rides a bike to work. I also saw my friends riding their bikes and having fun. I just wanted to be like them riding free like a bird with no boundaries. One other thing that got me to start cycling is that my family has a high rate of heart issues so I have to keep the heart running. C.U. : You have some special reasons for bike commuting. Can you tell the readers about that? B.T. Primarily it’s fun seeing people riding their bikes and there are so many amazing things to see in Ogden while riding my bike. My ride to work is 3.5 miles each way. It’s always warm to ride to work in the afternoon but coming home it can be cold at night. The roads are not as busy at so night so I can go faster and have more fun riding home. One big reason that I ride is due to a problem I have in my left eye called Keratoconus, which basically means I'm going blind. It’s safer to ride a bike than attempt to drive a car and end up hurting myself or other people. The final reasons why I ride are that I want to show people going green is always a lot more fun than riding in a gas guzzling car and that riding a bike is part of a healthy lifestyle. Bikes can take you where cars can but there are many places where cars can’t go such as bike trails. Your body will thank you everyday you ride because you’re building leg muscle and keeping your heart strong and pumping for many years to come. C.U. : I think you are the first Weber County bike commuter that I have profiled in my column. Tell me about Weber County bike riding. 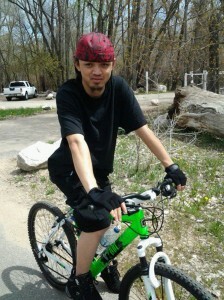 One of the things that I love about riding in Ogden are the amazing trails. My favorite would have to be the Dinosaur Park trails. You can ride the back side of it take it for miles down the road. I see a lot of work going on in the past few years with quite a few new trails opening up. I have yet to figure out when these will be opening but once they do it will bring more of a Family friendly atmosphere to these areas. Check out the numerous local bike shops as they can tell you a lot about their favorite places to take their families to ride. Cleanliness is the one thing that needs to be improved. When I ride through the West Haven trails there is a lot of trash and graffiti. If these were taken care of I would bet more people would be willing to come out to enjoy the many aspects of Weber County. C.U. : How does your eye condition affect your riding? B.T. : The Keratonconus affects the shape of my cornea, so I wear contacts. Since the shape of my cornea changes it’s really hard to find contacts that works for long period of times. Having a corneal transplant is my top thing to do but first I have to find a good insurance plan that will cover the surgery and future visits to an eye doctor. My night vision is good, a lot better than my day vision so there are no changes that I have to do during the night when I ride home on my bike. Overall I do not have problems riding at night. To protect my eyes from further irritation I prefer eye drops; they work pretty well. Wearing any thing that covers my eyes makes it a lot harder to ride so I prefer not riding with sunglasses to avoid any issues and accidents from occurring. C.U. : You mentioned some heart conditions in your family. B.T. : My Family has heart issues with major heart attacks and the heart going out of rhythm. Cycling will help me avoid these problems by keeping fit and staying healthy. It seems like many issues are caused by a lack of exercise so cycling will keep my heart strong and beating steady to take on the many trials and obstacles to come. C.U. : How does Wal-Mart assist you in your bicycling? B.T. : Wal-Mart has a good place to lock up my bike on the bike rack right outside the customer service and grocery doors. Either are a safe to lock my bike up for long period of times. I don't bring my bike inside due to the lack of space for employees like me that ride a bike. I bought my bike at Wal-Mart. it was a toss up where I should buy a bike. Wal-Mart does have a 10% discount on bikes if you are an employee. It’s not much but it helps. I can fix most problems on my bike. I prefer not messing with the bearings in the bike due to my lack of experience so I have my local bike shop do that type of work. C.U. : Which shop is your favorite bike shop? B.T. : The Bike Shoppe is my favorite bike shop. When you walk in the door you are instantly greeted with a warm hello and they help with your questions. These guys are highly recommended in my book to anyone who wants amazing service. So if you are in the Ogden area stop by and say hello, look around, but don’t be surprised that you may end up leaving with another bike! C.U. : One last word. You have a sister in the Army stationed back East. She must think you are pretty tough to ride to work every day. B.T. : My sister is stationed in Fort Jackson, North Carolina. She told me I’m crazy but I could see in her eyes that she is proud that I keep up with my work and do my best do to succeed with what I do. C. U.: Blair, Thank you very much with sharing your bike-commuting story with the readers of Cycling Utah. I would like to conclude by thanking Nate Foulger of The Bike Shoppe in Ogden for this bike commuter recommendation.